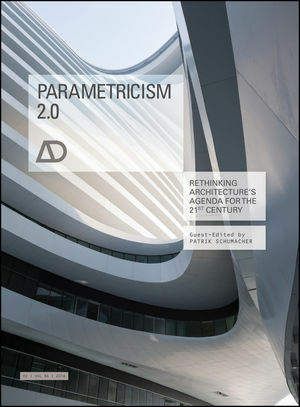 Parametricism is an avant-garde architecture and design movement that has been growing and maturing over the last 15 years, emerging as a remarkable global force. The tendency started in architecture but now encompasses all design disciplines, from urban design to fashion. In architecture, the style has an international following and is currently progressing beyond its experimental roots to make an impact on a broader scale, with practices like Zaha Hadid Architects (ZHA) winning and completing large-scale architectural projects worldwide. Parametricism implies that all elements and aspects of an architectural composition or product are parametrically malleable; and the style owes its original, unmistakable physiognomy to its unprecedented use of computational design tools and fabrication methods. All design parameters are conceived as variables that allow the design to vary and adapt to the diverse, complex and dynamic requirements of contemporary society. Although Parametricism has been talked about and hotly debated for a number of years, so far there has been no publication dedicated to Parametricism. The issue is guest-edited by Patrik Schumacher, partner at ZHA, and one of the world's most highly renowned advocates of Parametricism. Contributors: Philippe Block, Shajay Bhooshan, Mark Burry, Mario Carpo, Manuel DeLanda, John Frazer, Mark Foster Gage, Enriqueta Llabres and Eduardo Rico, Achim Menges, Theo Spyropoulos, Robert Stuart-Smith, Philip F Yuan. Featured architects and designers: Arup, Mark Fornes/THEVERYMANY, Zaha Hadid Architects (ZHA) and Ross Lovegrove. Patrik Schumacher has been a designer at Zaha Hadid Architects (ZHA) since 1988. He is a partner of the practice as well as a co-author of all major projects such as the MAXXI: Museum of XXI Century Arts (Rome, 2009), Guangzhou Opera House (China, 2010), Heydar Aliyev Centre (Baku, Azerbaijan, 2007–) and the Dongdaemun Design Park and Plaza (Seoul, 2014). He has been teaching at various architectural schools in the UK, continental Europe and the US since 1992, and held the John Portman Chair in Architecture at Harvard University's Graduate School of Design (GSD) in 2013. He is founder of the AA Design Research Laboratory (AA DRL), where he has continued to teach since 1996. In 2010 and 2012 he published the two volumes of his theoretical magnum opus The Autopoiesis of Architecture with John Wiley & Sons.